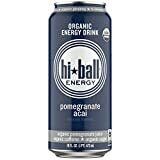 Hi Ball Energy Drink is considered a premium energy drink brand because of its use of 5% real juice, organic ingredients, and natural flavors. 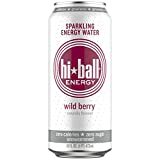 Recently Hi Ball switched from 10oz glass bottles to 16oz cans to better compete in the energy drink market. 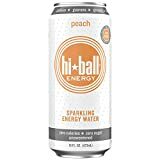 Hi Ball also makes a line of Energy Waters. These are sugar-free and still use all natural organic ingredients but they do not contain the 5% juice. They have the same energy ingredients as their energy drink. In addition to energy drinks Hi Ball now makes Energy Coffee and Protein Energy beverages as well. Hi Ball Beverages are sold both online and at major retailers around the country like Whole Foods, Giant, and BevMo. Hi Ball Energy Drink isn't recommended for children or those sensitive to caffeine. Purified Water, Fair Trade Certified Cane Sugar*, Sour Cherry Juice Concentrate*, Citric Acid, Natural Flavors, Caffeine*, Vitamin Blend (Niacinamide (Vitamin B3), D-Calcium Pantothenate (Vitamin B5), Pyridoxine Hydrochloride (Vitamin B6), Cyanocobalamin (Vitamin B12)), Panax Ginseng Extract*, Guarana Extract*. *Certified Organic. Sugar content: 25 grams (per 16 ounces). How Does Hi Ball Energy Drink Compare? Hi Ball Energy Drink contains 10.00 mgs of caffeine per fluid ounce (33.81mg/100 ml).